ARE YOU YOUR DOG'S LEADER OR LITTERMATE? Diane Rich's Dog Training programs set up you and your dog for success. You will learn positive training techniques to earn your dog's respect and trust, and have a great time in the process. Neither respect nor your leadership should be forced. Your dog may love you but will only listen to family members perceived by your dog as the leader. Respect and trust are THE foundation for leadership and the basis from which all good relationships should grow. You will learn how to communicate with your dog more effectively to create a happy, confidant, responsive, well mannered, social companion. We help you and your companion make a heartfelt and positive connection. You will learn how to do less to get more from your companion and get quicker more reliable results. You will learn how to keep your dog motivated by making the learning process fun. For over 30 years, Diane’s training programs have always included Real World training. Full training programs usually begin at your home and when your dog is ready we will meet at various public places to teach your puppy or adult dog to listen to you around distractions and learn to be calm around life's distractions. Real World training gives us the opportunity to proof specific learned behaviors. Real World training is the only way to teach your dog to reliably respond to obedience commands away from a controlled environment and learn public manners so you will be proud of your companion everywhere you go. One on one training programs are individualized for you, your dog and your goals. This personalized training is offered as a fun, step by step program for puppies, adolescent, adult and senior dogs. Private puppy training programs can begin as soon as you bring the new addition home. This is the best time to begin your pup's education. Our puppy programs shape your pup’s future behavior in a positive way. For over 20 years, training pups as young as 7 or 8 weeks has been part of our training process. We never believed a dog needed to wait until 4 or 6 months of age to begin his or her education. We always taught the initial phases of puppy training at the owner’s residence where distractions are limited and the pup’s health was not at risk. Our puppy programs include obedience training along with teaching you how to prevent problems or help solve any existing behavior problems. As the total educational process is part people training, the puppy program is quite comprehensive enabling you to feel most confidant with your puppy parenting skills. Socialization and distraction work is included with all our full training programs no matter the age of the dog. We help your pup begin the socialization process with other dogs by bringing well mannered, puppy friendly, calm, healthy dogs to training sessions. This service, included in our full training programs is offered when your pup is ready for socialization and distraction work but not ready to leave your property due to vaccination protocol. Proper, safe socialization should not wait until your dog is 4 months old. Think of this service as your own private mini group class! When your puppy has completed the vaccination series and is ready for more advanced training, additional socialization and distraction training in public areas is addressed. This next step teaches your puppy public manners and addresses other challenges you may face when out and about. Aggressive and non social behavior is addressed and specific socialization work is included for these dogs once owner handling skills and other training skills has proved successful to the trainer. Safety for the handler, dog, the trainer, other people and pets is primary when we address unsafe or dangerous canine behavior. Local Veterinarians, the humane society and breeders refer clients to us for aggressive behavior. Please be advised most aggressive behavior cannot be "cured" so to speak. Most dogs can be brought up to a more controllable level of behavior, so please keep in mind that addressing aggressive behavior usually requires lifetime management. We do not give up on dogs if an owner is committed to the process. These dogs are not comfortable in their own skin. Whether the behavior stems from nature or nurture, we help you build your dog's confidence in itself, you and the environment. Don't underestimate your adolescent, newly adopted dog or senior companion. 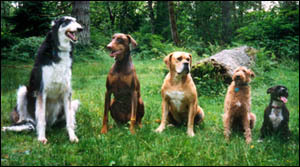 All dogs, no matter the age can succeed with obedience training, new manners and social skills. We can help you address long standing behavioral problems with your resident older dog or newly adopted dog and teach your companion safe and acceptable behavior. We help pet parents educate dogs up to 12 years of age. Yes, it can be done! If all you need is one session for an evaluation, troubleshooting, housebreaking, or fine tuning rather than a full training program, training is also offered on an hourly basis. Diane not only addresses general behavioral problems but tends to think outside of the box when addressing challenging behavior issues and helping owners and dogs realize success. As a behavior expert, Diane helps you understand your dog from the dog's point of view to alleviate any frustration in the teaching process and confusion from your dog in the learning process. Your dog's age, breed and temperament are just a few of the many important variables that determine what techniques will be used for shaping great behavior, teaching obedience skills and applying proper techniques for solving or preventing behavioral problems. No cookie cutter or formula training methods. Each session is individualized for you and is quite comprehensive. Our goal is to set you up for success and empower you with the knowledge and confidence needed to help you maintain great behavior with your beloved companion. Many dog owners want a dog to respond to them off leash. If you want to go the distance with your dog we offer off leash training if advanced training is your goal. Not all breeds are reliable off leash and we will give you an honest evaluation if your goals are possible with your particular dog. Camp Fraser, a fun, free range opportunity for overnight stays may be available to those owners who’s dogs successfully completed a minimum of one full training program and fit certain criteria. Camp is not open to the general public. Diane Rich, with over two decades of hands on experience teaching group classes, private training and boarding training is an expert in dog behavior and teaching obedience skills. Diane can help you mold and shape appropriate canine behavior in a positive way. Diane's main teaching philosophy is "Catch your dog doing something right!" "Thousands of wagging tails to her credit"